My first official view of Camp Harborview! Now that my work at Blacks Creek has wrapped up, I've had a chance to experience some other sites, as well as expand my reach within the realm of the Children's Museum. I was lucky enough last Thursday to be able to pay a visit to Camp Harborview. 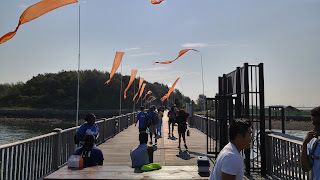 I had never been to the camp, or even Long Island (the Boston harbor version), so I was excited to check it out. It was a nice boat ride over, and I enjoyed listening to the campers pump up their energy levels by singing their warm-up songs. I actually had no idea that Camp Harborview was a day camp, as I didn't think a boat ride there and back each day was not feasible. Having spoken with one of the kids, it sounds as if that would work well. He told me that it's such a long day, and is, "even longer than his day at school". That's not to say that the length of the day ruins the experience, as all I saw were happy campers, and plenty of activity. They have a great set-up there, and it's so much larger than what I had expected with my view from the harbor. There's a beach and a pool, a high ropes course, a dock to fish on, a giant field, an organic garden, and much more to keep your average Boston youth entertained. Searching for invasive species, see how many you can spot. 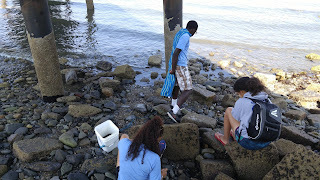 Since the day saw a different schedule than normal, we were able to spend our first hour scavenging the shore for Asian Shore Crabs and Periwinkles. Perhaps scavenging is the wrong word, as you couldn't flip a single rock without finding a crab or five periwinkles. This is due to the fact that they are invasive species, meaning that they are a species that was introduced through unnatural means, and are taking over the ecosystem. At Save the Harbor we've started finding measures to help control these populations, one method being cooking delicious food with them. We collected a great deal, which our Vice President Chris cooked up. I didn't sample it myself, as I ironically do not enjoy eating seafood, but I have heard the recipe is good. When we weren't collecting morsels for Chef Chris, we were helping out with a STEM fair, as well as the Fishing Club. I would have to say, my favorite part of the STEM fair was the station in which all the kids worked through a financial literacy worksheet that caused them to think about saving for the future. While it was not super in depth, and may not have been a dream summer activity, I thought it was important. I wish I had begun thinking about my finances earlier in my life. I don't know if it's necessarily something that every kid is going to take to heart, but it seemed to resonate with some of them. I overheard a counselor talking to a camper, reminding him that if his dream of playing professional baseball falls through, he'll need a back up plan. I also saw a kid reading through the sheet again, long after they had moved on to another activity. After a delicious lunch, the time finally came for us to do what we do best, and that is teach kids how to fish. While we were not lucky enough to catch any fish that day, we did have some red rock crabs in the trap, which are quite different than the green crabs that I'm used to. Some of them even had limpets and barnacles clinging to them, which were the kids were interested in. But their clear highlight was when Jennifer showed them all how to feed crabs, and they could not stop attempting to feed them. Of course, some continued fishing in the hopes of catching a whale, while one boy sang to us with the voice of an angel, which he usually uses to serenade the members of his church. All in all, I liked having a chance to visit another site, and see how things go throughout the harbor. Fishing club was one of the most popular activities at Camp Harborview, and it's nice to see that boys and girls of many ages are drawn to the water. Whenever people talk about kids these days, they act like they're distraught without their technology to guide them. All I see, whether I'm at Childrens, Blacks Creek, or Camp Harborview, are kids who are fascinated by the world around them. It's up to us to help them explore.